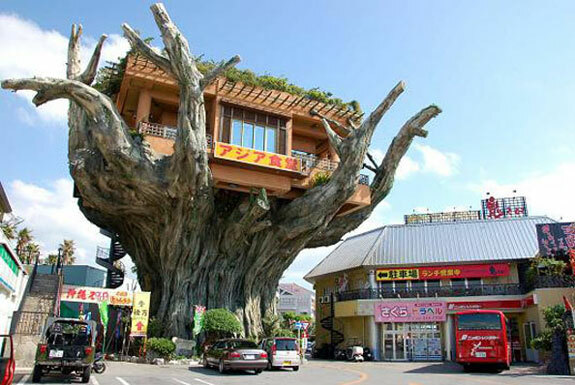 What’s the story behind what must have been the largest tree in Japan? What happens to the restaurant when the ex-tree’s wood rots? How did they build an elevator through the tree? 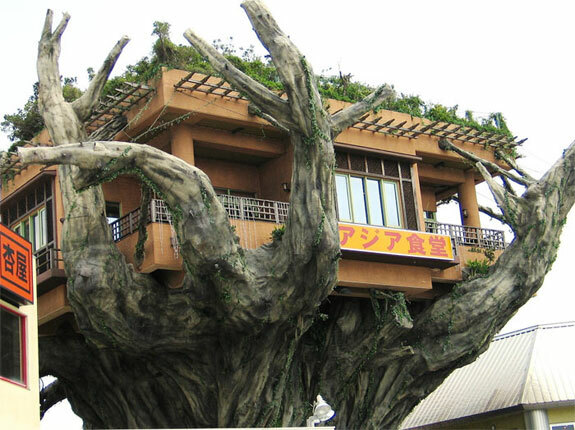 And how did the restaurant end up in the tree to begin with? It turns out the answers to all those questions are essentially the same . . . The 6 meter (20 foot) high wood-looking foundation holding up the Naha Harbor Diner is actually made of concrete (though with real vines planted upon it). After an initial bout of disappointment, we decided to declare this a cool restaurant anyway. Because, well, just look at the photo of this place! And because the restaurant’s concrete-tree perch serves a useful purpose, providing patrons with scenic views over the harbor from one side of the restaurant and over Onoyama Park from the other. 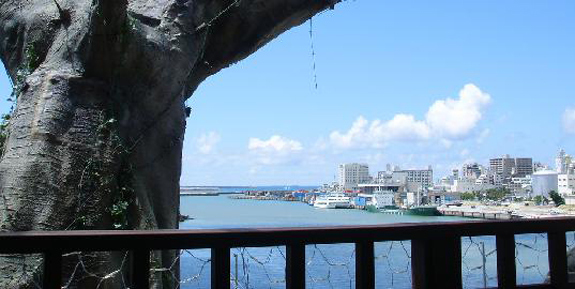 Further, the Naha Harbor Diner doesn’t simply rest upon it’s gimmicky arboreal foundation. This place serves great organic Indian, Italian and Japanese dishes using locally produced ingredients. The Naha Harbor Diner is also reasonably priced (relative to Okinawa’s other restaurant offerings). We suggest the Inshor fish bouillabaisse for ¥1,750 (about US$20, €15). Check it out next time you’re in Okinawa.